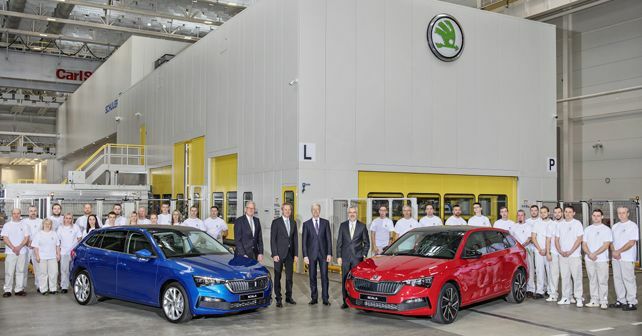 After making its global debut in December 2018, the Skoda Scala has officially entered series production at the Czech manufacturer's main production plant in Mladá Boleslav. Skoda Auto has rolled off the first production unit of its all-new compact car, the Scala, from its main production facility in Mladá Boleslav. Unveiled in December last year, the Scala ushers in a new era for the Czech brand as it is the brand's first model to be based on Volkswagen's MQB-A0 platform. This platform, prior to the Scala, underpinned the Volkswagen T-Cross and the international-spec Polo. The Scala borrows its design elements from the brand's Vision RS Concept and it also becomes the first model to replace the iconic Skoda badge for the 'SKODA' block lettering across the tailgate. With the Scala, Skoda aims at providing its customers with features and tech of higher-tier segments. As a result, the car will be offered with safety features like Lane Assist, Blind-Spot Assist, Side Assist, Adaptive Cruise Control and up to nine airbags. Further, the Scala will also become the first Skoda model to be offered with full-LED headlamps and taillamps. The base variants of the Scala are expected to go on sale in Europe in the second quarter of 2019.